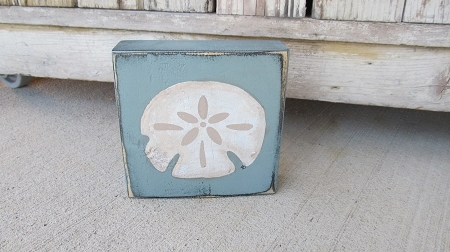 Nautical Beach Coastal Sand Dollar Wooden Sign Block. Love this new ocean blue color called Agave. The background of the sign is in the Agave color with a Marshmallow colored sand dollar hand painted on. The edges of the sign were sanded for a rustic beach look. The little sign block is perfect to set on shelves or tuck inside cabinets, back of toilet tank. Size is 5 1/4"x5 1/4"x2". Solid pine wood. Hand painted, designed and signed by Heidi.